The first of the new models to launch in 2014 will be the Talaria 43, slated for a June splash. The boat features a very sociable layout, easy and accurate joystick controls and the iconic Hinckley good looks. New to Hinckley and to boating in general is a hard aft enclosure that disappears with the touch of a button. Closed, the windows and door combine to make the boat weather tight and secure; wide open, she is an express without the hassle of canvas. The system has a patent pending. Also new to Hinckley is the option of building a Talaria 43, 48 or Picnic Boat with the Volvo IPS system. “We have been a jetboat company exclusively, but we felt that now was the right time to offer IPS to those boaters who prefer it,” Fitzpatrick explained. Six Talaria 43s have been sold so far, and in 2014 the company will launch its first IPS-driven boat. The second new model to launch this year will be a sailboat, the Bermuda 50. The boat’s predecessor, the Bermuda 40, is widely considered a classic whose innovative nature, graceful lines and popularity over 30 years won it a place in the Sailboat Hall of Fame. The new boat is designed by Bill Tripp, the son of the Bermuda 40 designer. The molds to begin the building of the new model will arrive at the Trenton building facility in March. Hinckley was acquired at the end of 2010 by Scout Partners, a partnership between David Howe and Pete Petersen, former U.S. Secretary of Commerce. In 2013, Scout Partners also acquired Hunt Yachts. The two boat companies will retain separate building operations. Hinckley was founded in 1928 in Southwest Harbor and currently builds sail and powerboats from 29 to 70 feet. 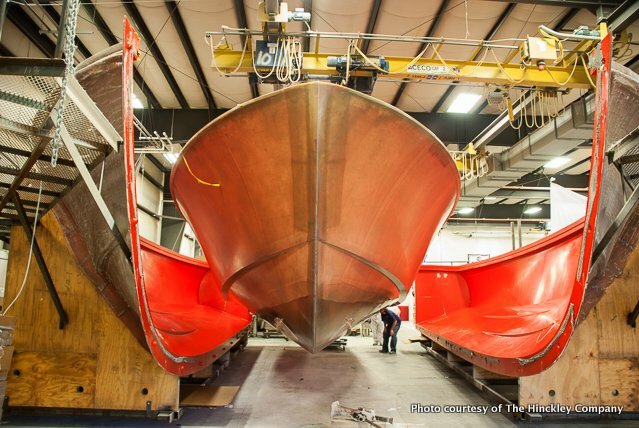 The Hinckley Company also operates boatyards from Maine to Florida servicing all types of boats.